Soon after the end of WWII Franke & Heidecke started further improvements of their hugely succesfull 6x6 Automat series. 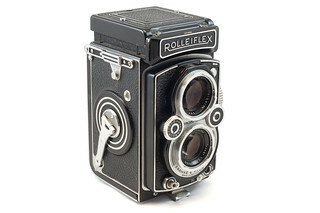 This resulted in a series of Rolleiflex 3.5 TLR's which were produced during a period of 27 years. 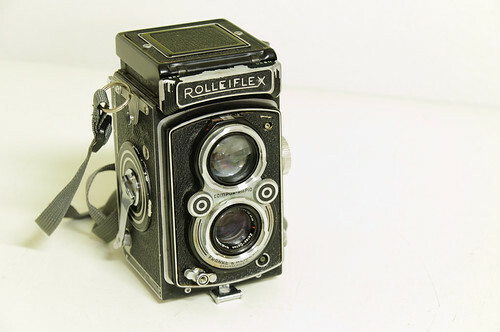 Also often called Rolleiflex Automat model X.
Carl Zeiss Tessar 1:3.5 f=75mm, Coated. or : Zeiss Oberkochen Opton Tessar 1:3.5 f=75mm, Coated. or : Schneider-Kreuznach Xenar 1:3.5 f=75mm, Coated. Filter Bayonet : Both lenses, size 1. Shutter: Compur-Rapid X CR00 leafshutter. Speeds 1 to 1/500 sec. and B. 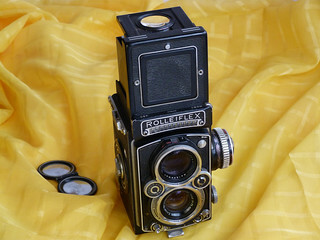 Also often called Rolleiflex Automat model 4. Only differences with Rolleiflex 3.5 shown. Shutter: Synchro-Compur MX CR00 leafshutter. Speeds 1 to 1/500 sec. and B. Only differences with Rolleiflex 3.5 A shown. Only differences with Rolleiflex 3.5 B shown. Type K4C : Carl Zeiss Oberkochen Planar 1:3.5 f=75mm, Coated. or Type K41 : Schneider-Kreuznach Xenotar 1:3.5 f=75mm, Coated. Only differences with Rolleiflex 3.5 C shown. 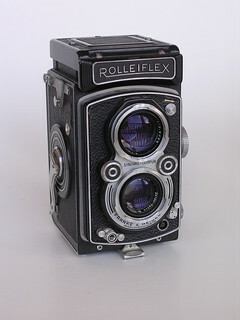 Note that the Rolleiflex "3.5 E2" came later on the market than the "3.5 F" and was the result of a demand for a Rolleiflex 3.5 without build-in lightmeter. Carl Zeiss Oberkochen Planar 1:3.5 f=75mm, Coated. or : Schneider-Kreuznach Xenotar 1:3.5 f=75mm, Coated. 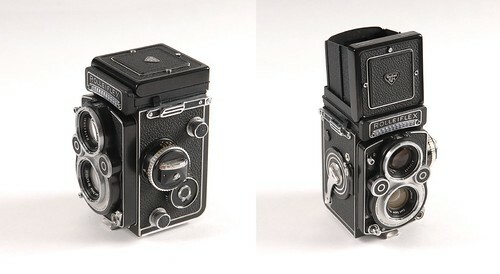 Only differences with Rolleiflex 3.5 E2 Model 1 shown. Only differences with Rolleiflex 3.5 E2 Model 2 shown. 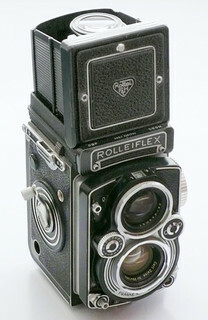 Note that the Rolleiflex "3.5 E3" was produced parallel to the "3.5 F" and was the result of a demand for a Rolleiflex 3.5 F without build-in lightmeter. In construction it is largely based on the 3.5F. Carl Zeiss Oberkochen Planar 1:3.5 f=75mm, Coated, 6 elements. or : Schneider-Kreuznach Xenotar 1:3.5 f=75mm, Coated, 6 elements. Combined lever (MXV) for Selftimer and M- and X-synchronization. Shutter: Differential Synchro-Compur MXV CR00 leafshutter. Speeds 1 to 1/500 sec. and B. Only differences with Rolleiflex 3.5 F Model 1 shown. No button for LV (Light Value) lock. Only differences with Rolleiflex 3.5 F Model 2 shown. Shutter: Synchro-Compur MXV CR00 leafshutter. Speeds 1 to 1/500 sec. and B.
Claus Prochnow, Rollei Report 2, third edition, Braunschweig, Lindemanns Verlag, 2008, ISBN 3-89506-220-0. This page was last edited on 13 August 2017, at 08:52.